Good news for the candidates preparing for the Telangana State Government Jobs. The TSPSC Group 1 Hall Ticket 2019 is about to release by the higher officials of the Telangana State Public Service Commission. There are 137 vacant positions for the posts of Revenue department Deputy collector, DSP, Commercial tax officers, District Registrars, Municipal commissioners ( Grade 2 ), SC development officers, BC development officers, District employment officer, Administrative Officer, Assistant Treasurer, Assistant audit officer, Mandal Parishad development officer, Cooperative society deputy registrar. The Telangana State PSC officials have not yet announced any information regarding the examination date and the hall ticket release date. Hence, candidates keep on preparing for the exam. After the official release of the dates, we will provide you the information through our page. Also, you can check the TSPSC group 1 Recruitment notification provided on this page. 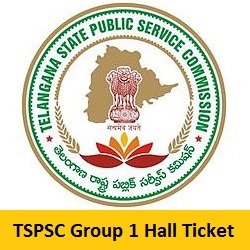 The Overview Of TSPSC Group 1 Hall Ticket 2019 gives you the complete details about the posts, vacancies, job location, official website, examination date, admit card release date and so on. Aspirants can have a look at it for the brief information about the Group 1 Examination 2019. The selection process for the TSPSC Group 1 Examination 2019 mainly comprises of a WRITTEN TEST and an INTERVIEW round. Candidates who clear these rounds will be recruited for the eligible posts. Usually, the tspsc.gov.in Admit Card 2019 contains information about the aspirant and also the examination such as the name of the candidate, examination name, application number etc. Therefore, Soon after downloading the hall ticket, candidates need to check the details present on it. If there is any issue regarding the details, you can report it to the officials of the Telangana State PSC. There are some mandatory documents which are to be carried to the exam center. The examiner will check the identification proofs of the candidate as a part of verification purpose. Therefore, candidates should take any of these documents. Candidates can note the list of documents given below. To download the TSPSC Group 1 Admit Card 2019, aspirants need to follow these steps. Initially, candidates need to go to the official website of Telangana State Public Service Commission i.e., tspsc.gov.in. You will get the home page of the official site displayed on the screen. On the home page, you can find many modules such as notifications, hall tickets, results, marks memo etc. Now, enter into the hall tickets module and search for the TSPSC Group 1 Hall Ticket 2019. If the download link is found, then click on that link. Enter the details that to be given like application number, date of birth, one-time password. After entering the details, check them once again. You will get the TSPSC Group 1 Admit Card 2019. Download the admit card and also do not forget to take the hard copies of the admit card. Carry it to the examination hall along with some identification documents. Candidates need to note that the officials have not yet announced the date of the examination and release of the admit card. Whenever the official announcement is given regarding the TSPSC Group 1 Examination 2019, we will post the news on our page. For any queries about the information provided, you can contact us at freshersnow.com.